AAS is the only national, non-profit plant trialing organization in North America. Before AAS, in the 1920’s and 30’s, consumer magazine editors knew little about new garden varieties and had few resources to obtain reliable information. As a result, articles were sometimes misleading or incorrect. The “Garden Club” movement was in its infancy and needed material. Home garden, farm seed and florist magazines all were hungry for garden news. 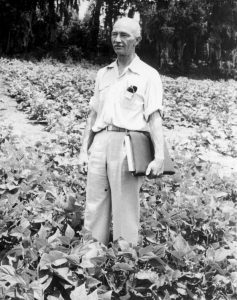 In 1932, W. Ray Hastings was president of the Southern Seedsmen’s Association of Atlanta, Georgia. He proposed the idea of All-America Selections as a way for home gardeners to learn which new varieties are truly improved. To do so, he encouraged all seed companies to set up trial grounds, cooperatively test new varieties and agree to develop marketing efforts for new vegetables and flowers. Mr. Hastings recommended a national network of trial grounds throughout North American climates where flower and vegetable varieties would be grown and assessed by skilled, impartial judges. The seed trials would accept only new, previously unsold varieties. AAS was founded in 1932 and the first AAS Winners were announced a year later, after the results were tabulated from the first trial. AAS Winners have been introduced each year since 1933. In 1934, there were 30 AAS Award Winning new varieties introduced, a record number. All-America Selections is an established 501(c) 5 non-profit organization. All proceeds go into conducting the trials and promoting AAS Winners both old and new. How many judges participate in the AAS Trials? The number of Judges and sites may vary by year, but the trials are always conducted in approximately 80 trial sites throughout the United States and Canada. AAS Judges are professional horticulturists who volunteer their time to evaluate all entries next to comparisons. Universities, public gardens, breeding companies, growers, brokers, extension agents and retailers are current and potential judging sites. How are the comparisons chosen and where do they come from? In a show of extreme industry support for All-America Selections, competing breeding companies donate seed to be used as the comparisons for each entry. The comparisons are selected by a number of industry experts, including current and past judges. They are tasked with chosen current varieties on the market that have very similar traits to the entry and are considered market standards. How many type of awards are there? There are three types of awards in four categories of trials. There is an AAS Gold Medal Award, only given once or twice a decade, and is reserved for a breeding breakthrough. The standard AAS National Winner designation recognizes an ornamental or edible for significant breeding achievements, proven to demonstrate superior garden performance as compared to other like varieties on the market. Judges are asked to evaluate characteristics such as earliness, taste, disease-resistance, uniqueness and more, depending on the species. The AAS Regional Winner designation is given to varieties that do not perform exceptionally well in ALL regions but instead exhibit specific performance in just a few specific regions of North America. What are the four types of trials? Does AAS advertise the winners? AAS does not advertise the AAS Award Winners. Instead, AAS relies upon a public relations program to inform gardeners about AAS Winners that are announced three times each year in November, January and July. Consumer magazines, newspapers, garden and lifestyle blogs, garden club bulletins and cooperative extension agents are depended upon to introduce AAS Winners to home gardeners. In addition, AAS and sister organization National Garden Bureau have an extensive Social Media Community where AAS Winners are featured and stories told about the breeding and/or trialing process. The AAS brand has been likened to Underwriter Laboratories or Good Housekeeping’s Seal of Approval. AAS entries are “Tested Nationally & Proven Locally™” so a consumer can be assured of superior garden performance when planting AAS Winners. Past President – Connie Dam-Byl, William Dam Seeds Ltd.